This site was originally set up for the use of all Sealy owners to track the prevalence of Primary Lens Luxation (PLL) in our breed, utilizing all the information in our SIGHT Registry collected by GDC (Institute for Genetic Disease Control). Thanks to the participation of nearly 200 Sealyham owners and breeders we were able to send blood samples from dozens of affected dogs and their relatives to Dr. Gary Johnson's research project at the University of Missouri. Those samples were crucial to his success in identifying the defective gene that causes PLL in Sealys and several other terrier breeds. More than 100 Sealy owners have had their dogs tested and these results have been added here in the Sealyham Terrier Health Guard Database. 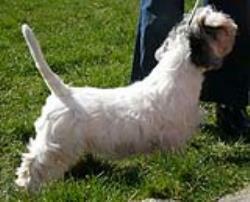 With the new DNA test for PLL, all Sealyham Terrier owners can now test their Sealys for the good of our breed. We can eliminate scourge of Lens Luxation within a few generations. CLICK HERE for DNA Test info. BUT THIS SITE IS NOT JUST FOR EYE PROBLEMS. It's designed to track and provide information for any and all diseases and anomalies that plague our breed - skin problems, epilepsy, back problems, cancer, deafness and others. We need complete health information on our dogs so we can see where the major problems are and invest our research dollars accordingly. In the "Comments" section of your dog's information sheet you can share with all of us how you dealt with any health issues your own Sealy has had. Through this global database we can share health, pedigree and breeding status information from all over the world. Forgot Login Info? Click here. Sealyham owners & breed fanciers may join. No cost for registration & use. Owners enter dogs' health, certification, & general info. Share pictures, pedigrees & breeding availability. Registration is required to access the database. We've created this online resource as the "go-to" place for health care information. From a review of flea-control products to a report on vaccination studies, you'll find articles and resources dedicated to helping you keep your Sealyham Terrier healthy in these pages. Thanks to the participation of nearly 200 Sealyham owners and breeders in the Sealyham SIGHT Registry from 2004-2009, we were able to send blood samples from dozens of affected dogs and their relatives to Dr. Gary Johnson's research project at the University of Missouri. Those samples were crucial to his success in identifying the defective gene that causes lens luxation in Sealys and several other terrier breeds. Now, with an inexpensive DNA test available through OFA, you can find out if your dog is at risk for becoming affected or for carrying the defective gene. CLICK for more info. Lens Luxation is an "autosomal recessive" genetic disease. To be affected, the dog must inherit a copy of the defective gene from each parent. A dog with only one copy won't become affected, but it will be a "carrier". � Compatible with recent versions of popular web browsers. � Best viewed with 1024x768 pixel resolution or higher.